One thing I love about living in New York City is that you can find, within a stone's throw, just about anything you're looking for. Yesterday I went in search of a restaurant I could bring wine to without the typical $25 - $50+ corkage fee. I googled "Free corkage Tuesdays NYC" and that's how Joel and I ended up having dinner at The Milling Room (Columbus Ave & 82nd St) with a very special bottle of wine, straight out of our wine closet. Executive Chef Phillip Kirschen-Clark is serving up inventive, locally-sourced American cuisine in a beautiful space with tables far enough apart that you don't feel packed in. When it's light out, the enormous skylight high above the dining room bathes the room in a soft glow and, after dark, it becomes a romantic candlelit space. Or, you can eat at the long bar to the left of the entrance if you want more of an action-packed scene. 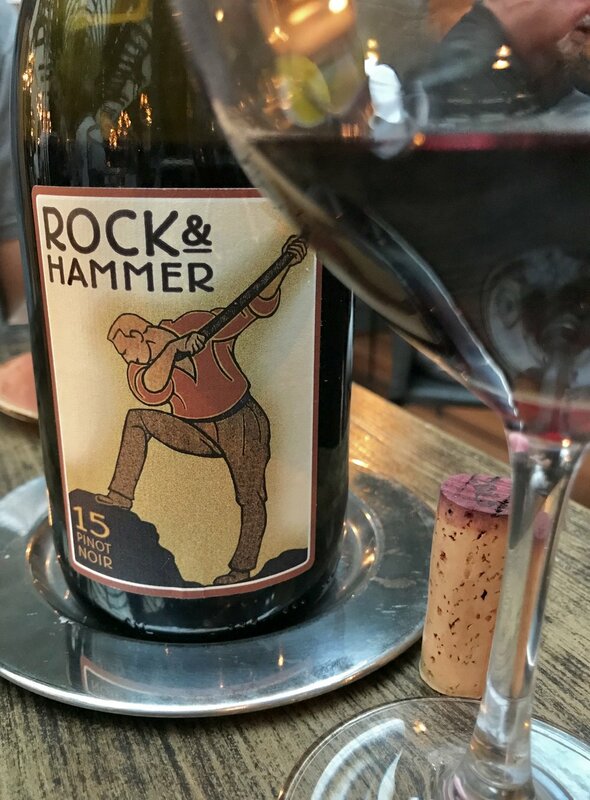 To go with dinner, we brought a 2015 Rock & Hammer Pinot Noir from Oregon. This special wine is produced by Rex Hill Vineyards for NBA coach Gregg Popovich, the largest outside investor in A To Z Wineworks, the company that owns Rex Hill. Rock & Hammer wine is never for sale and whatever the coach doesn't drink or give away ends up in charity auctions. Joel, who works in the sports business, was grateful to receive two bottles of this limited edition wine from Gregg himself. This juicy expression of pinot noir has aromas of cherries, plums and licorice that carry through generously on the palate. It's the kind of wine that one sip leads to the next and before you know it, it's gone and you're saying, "What happened to the wine?!" Medium-bodied, with velvety tannins and a slight spiciness on the long finish, it's delicious! The sad thing is that the closest you may ever get to a bottle of Rock & Hammer is at the winery where you'll find four empty bottles in a display case with a basketball signed by Coach Popovich. But the good news is that Rex Hill makes other fantastic pinot noirs that are for sale! The Jacob-Hart Vineyard, a single vineyard offering, is a lush and full-bodied pinot that would be excellent substitute for Coach Gregg’s. On the back label is a quote by Jacob Riis that is on the wall in the San Antonio Spurs locker room, a testament to Popovich's belief in the value of persistence. Chef Phillip was on his game last night with these flavorful dishes. And a shout out to our server, Michael, who led the way with excellent service. Amazing rendition of chilled yellow tomato soup with thin strips of kaffir lime and tiny pieces of candied ginger. Each component of the dish came together in an explosion of fresh summertime flavors. Salmon belly crudo with cucumber, Cantaloupe, watermelon and radish in a refreshing melon vinaigrette. A "wow" dish! Underneath the thin slices of hearts of palm was a beautifully cooked piece of salmon with pickled onions, drizzled with a sweet and sour gastrique. 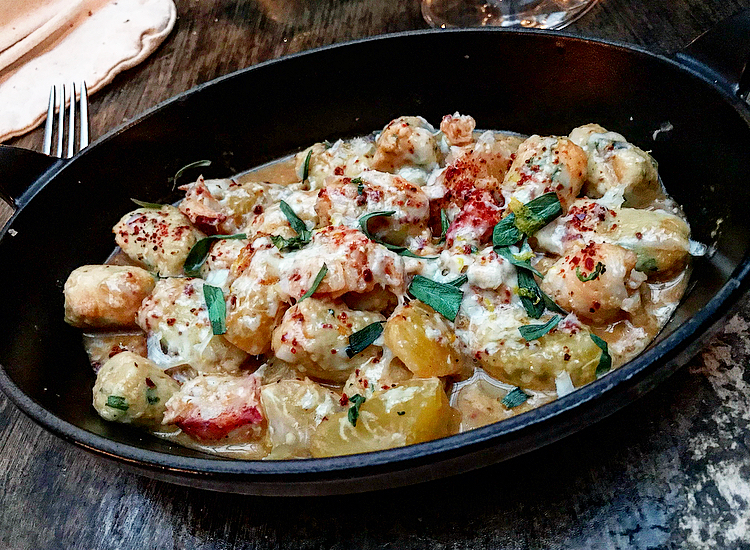 Pillowy gnocchi, called 'dumplings' with chunks of lobster, orange segments, gruyère cheese and tarragon. This was a lightly creamy dish with a bit of lobster broth and, Though I love cheese, I'm not sure the gruyère went with the other flavors of the dish. I would order it without the cheese next time. A grand finale, Warm chocolate torte with vanilla ricotta, cherries and sea salt. Yum!